Technology | Why Dont You Blog? He is terrified that the net is killing his print titles – like the British newspaper, the Sun (:-) What a loss to the written word that would be, not) by offering free news. He is so convinced that people will happily pay for trash content that he’s been busy trying to get every one who will listen – including a federal trade commission – to support this idea. Which rather seems to contradict the whole concept of people’s willingness to pay. If that were true, wouldn’t people just happily pay. Surely, he’s not demanding preferential treatment? Isn’t the untrammelled market the perfect mechanism any more? Gosh, you shock and stun me, Mr Murdoch. For those of you with an interest in ancient history, Murdoch was at the centre of a bitter labour dispute in the 1980s, based on his determination to break the print unions through the use of new computer technology. Whosoever diggeth a pit, etc…. Wow, “danger”, “perils” to children, “help – before it’s too late”. What a scary Times headline! I am already shaking with fear before I’ve read it. Won’t anyone think of the children, and so on? What is this scary thing? Of course, it’s the internet. The campaign seems to involve asking kids if they can use any tech and getting very afraid when they say yes.. The campaign’s catalyst is Byron, known for her television programmes The House of Tiny Tearaways and Am I Normal?, as well as the author of the government-backed 2008 Byron Review Safer Children in a Digital World, which resulted in the creation of the UK Council for Child Internet Safety. Well who else could the government call on? Obviously, no amount of experience or qualifications or all-round peer-reviewed respect gained by any other child psychologist, or by any person who actually knows anything about the internet, could stand up against the fact that she’s got tv programmes. The busy Tanya is panicking about the UK not implementing some European directive on games classification. Or all of her recommendations, really. So she’s going from school to school asking questions, to support the idea that kids may know things about using the internet that their parents don’t. And that this is somehow inherently terrifying…. The games classification thing is typical of the kneejerk reactions of this “grassroots” campaign. For a start, it’s inherently counter-productive, in terms of their supposed goals. Would anything make a game more attractive to an early teenager than an 18 certificate? Is there any evidence that playing pc or console games that are “too old for them” harms kids? Any evidence at all? Is there any evidence whatsoever that parents are all in a strange population subgroup that failed to notice anything that happened over the last twenty years? Like the arrival of the Internet. How many adults do you know who don’t use computers or the net? There’s a more internet and computer nonsense on the BBC today. Technology addiction among young people is having a disruptive effect on their learning, researchers have warned. The study – Techno Addicts: Young Person Addiction to Technology – was carried out by researchers at Cranfield School of Management, Northampton Business School and academic consultancy AJM Associates. The blurb talks up the shock value of this “bestseller”. Technology addiction amongst young people, particularly in terms of facilitating social networking, is having a disruptive effect on positive attitudes towards learning. Read the results of this collaborative study spearheaded by Cranfield School of Management, Northampton Business School and AJM Associates. While students expressed little concern of addiction, technology obsession is hindering spelling skills, encouraging plagiarism and disrupting classroom learning. Download this report to learn the full details and the disturbing impact technology is having on today’s youth. Call me a pedant – despite my possible incipient adult-onset internet addiction – but “While students expressed little concern of addiction,” doesn’t seem like correct grammar to me. And surely they don’t really mean to claim that technology addiction is “facilitating social networking”? Otherwise, I think that – if you really want to protect your kids online – you actually talk to them. While I have been busy over the last few weeks I’ve been unable to spend time looking at the stats for my Flickr images – this is unusual because all of us at WhyDontYou towers are somewhat stats obsessed. However, I found time to catch up today and what a bit surprised. For some reason, this image has been getting more traffic than any other image over the last month, and almost all this traffic is coming from google images. Over the last month, 91% of the traffic to this image has come from google images (almost all using “Animals” as the search term) while a further 8% has come from Yahoo Images (even more bizarrely, this is normally from a search for “Boxing”…) with almost none coming from organic Flickr searches. I have tried both google and Yahoo searches and I cant make this image appear in the first 10 pages or so of either engine. If anyone has any insight as what may be causing this, I’d love to hear it. Despite a bit of jet lag, I am now back and all settled in at home again. I had planned to return to blogging with new found gusto – and given the amount of drivel floating around in the UK at the moment there is a LOT for me to whine and rant about. However, we now have a Nintendo Wii in the house. After a long time in which I have avoided all contact with any of the latest gaming machines (for me Civilization 4 on the PC was the pinnacle of all computer gaming), I cracked and we took ownership of a Wii and Sports Pack. I am now a full blown addict to the bowling game and the competitive streak in me has turned this “game” into an almost full time obsession. In the few minutes I have sat here typing, I am fuming that other people are bowling and stopping me get the much needed practice that will take me to 300 points. I curse my family members (silently) when they are on it, because they are taking time away I could be using it. Then there is the boxing. Despite getting battered by every fourth or fifth opponent, I acutally like this. I get carried away with it enough that after each round my arms ache, I am covered in sweat and anything fragile within about 3m has been destroyed. I’ve been away for a while, so it was with shock, horror and sadness I realised that FSTDT had died, but it was joy when I realised it had been resurrected. The posts can now be found at FSTDT.net, although it is still very rough and ready. As you can see, the look and feel has remained, but the new system means there are a lot less quotes getting through. IMHO this is both good and bad, in the past some pretty un-fundie quotes were being approved, but at least you were getting a lot of comedy. Now it seems like there is only going to be a quote or two each day. With the restrictions placed on moderation, there is also a good chance that only quotes from known-regular-fundies will make it though – everyone else is scared of approving non-fundie, non-funny stuff. Hopefully none of this will transpire and my pathetic attempts at prediction will remain pathetic. A few other things I don’t like about the changes are – the lack of any ability to edit your own posts; the difficulty in getting back to the post index/archives after you have viewed a comment and the lack of apparent monthly threading. It is possible that Distind is going to address these points, so time will tell. Everyone is scared about malware and hacking on the web. There is nothing wrong with this and there really is a genuine threat out there. People need to make sure that their browsing is as safe as possible. For most people, unless you are running a high volume internet banking transaction server this can be simply done by getting a good anti virus (AVG Free is cost effective) and a firewall (windows own, Zone Alarm or one on your router). Despite this a lot of online organisations feel the need to join in and help out. Most modern browsers have built in “phishing filters” and will try to alert you when you click on what it thinks is an untoward link. This is all well and good and there are only minimal privacy implications. Equally, search engines are doing the same thing now. When you google a search term, you get links with any potentially harmful ones highlighted. Just in case you ignore google’s advice, they have a blocking page pretty much ensuring you cant click through to malware from google. Again, this may seem all well and good but there are even more issues. For a start, it is down to google to decide what is, or isn’t malware. They may be correct 99% of the time, but what about the other 1%? It becomes the responsibility of the website owner to discover they have been flagged as “malware” by google and then jump through google’s hoops to clear their name. This is wrong. More importantly, who is responsible when there is a problem with google? A sensible hacker could target google’s servers and create the illusion that certain companies are full of malware. It would take a brave person to ignore the warnings and keep going through to a site that is so heavily flagged on the search page. The whole internet is infected with malware. Every link is flagged with the dire warning it may harm your computer. I am not alone in discovering this… (PCPlus simply suggests using another search engine for the afternoon, Neowin is more informative) Google isn’t hacked (this time), its just broken. The effect is the same though. 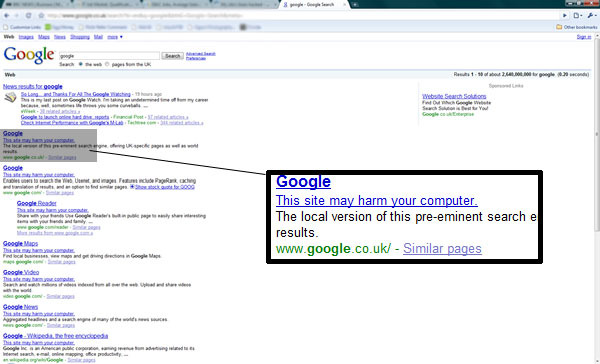 Any attempt to search meets with this warning and googles intervention means you cant ignore it and click on. Well done Google – you have borked searching… Amazing. This is (IMHO of course) the problem with allowing web services to have more and more control over our daily lives. It is bad enough that the most popular search engine on the internet suffers a glitch like this, but imagine if you were using Google to host your remote office systems – an outage can be crippling. Cloud computing may be in vogue, but it is fundamentally a bad idea. You can not delagate your responsibilities to unaccountable groups – you are responsible for making sure no malware gets on your PC, so why does google feel the need to intervene? I decided to have a cup of coffee rather than randomly searching Google for a few minutes. For the good of the planet. These statistics aren’t completely convincing, being generated, as they were, by a guy who’s set up a website to sell a clean conscience to websites. People want websites they visit to be eco-friendly. CO2Stats helps you attract and retain those visitors. So, “stick to really dull webpages and don’t visit YouTube or sites that use Flash” sounds more immediately effective advice than buying spurious energy credits. ….. carbonfootprint.com, a British environmental consultancy, puts the CO2 emissions of a Google search at between 1g and 10g, depending on whether you have to start your PC or not. Simply running a PC generates between 40g and 80g per hour, he says. Chris Goodall, author of Ten Technologies to Save the Planet, estimates the carbon emissions of a Google search at 7g to 10g (assuming 15 minutes’ computer use). Nicholas Carr, author of The Big Switch, Rewiring the World, has calculated that maintaining a character (known as an avatar) in the Second Life virtual reality game, requires 1,752 kilowatt hours of electricity per year. That is almost as much used by the average Brazilian. Wait, if using a PC at all emits ~60g an hour, ie, 1g a minute, doesn’t that mean you are saving 0.8g a minute by looking at complex websites? I am sure that computer use is mostly a waste of energy. I am sure that big powerful servers are even greedier than my PC. However, I’m not convinced by the idea that you can buy your way out of responsibility for ecological damage. Paying to generate some less-polluting-energy doesn’t mean that the more-polluting-energy you used before suddenly disappears. Congestion charges, aviation carbon taxes and so on. They all suggest that you won’t cause ecological damage if you can afford to pay for it. It’s like buying and selling medieval indulgences. This would be great if the Earth was susceptible to bribery. I think these schemes are usually just ways for us to avoid taking any real steps to stop destroying the Earth. In some ways, they are worse than doing nothing, because they give us the illusion that we are taking serious steps to save the environment and that we can do this without any major inconveniences. When does this global warming hysteria end. It seems like all these die-hard environmentalists would like us all living in huts with no electricity, comforts, or heating. Especially considering this freezing winter (against all predictions), I’d like to see them go first. I call for a moratorium on publishing articles like this one. The amount of CO2 generated when my head starts to steam is much higher than a Google search. Multiply that by the millions of sane people who agree with me that GW is a crock and GW might actually come true. The calculations are ridiculous and blatantly misleading. But no surprise, it appears that this will be another cold year and the “environmentalists” are running up and down in a total panic that they failed to fully socialize the world while for a few years was a bit warmer. And why should we care how much energy Google uses…because of the myth of Global Warming that is being forced down our throats. It looks as if even people who are too monumentally stupid to see that a cold year doesn’t in itself invalidate climate change are still bright enough to see that these figures are a bit bogus. Why give them ammunition? The idea of a “carbon footprint” as an individual moral issue, susceptible to individual guilt and contrition is just mistaken. It’s obviously good to do whatever we can as individuals, but it’s a social and political issue, which needs serious social and political solutions. In a terrible indictment on the UK government, Andy Burnham (Culture Secretary) demonstrates some fundamental gaps in his knowledge of both the mystical internet and what freedom of speech means. Film-style age ratings could be applied to websites to protect children from harmful and offensive material, Culture Secretary Andy Burnham has said. Mr Burnham told the Daily Telegraph the government was looking at a number of possible new internet safeguards. He said some content, such as clips of beheadings, was unacceptable and new standards of decency were needed. Briefly defending him, Mr Burnham has only suggested it as an option. But that is as far as my charity will go. First things first. Film style age ratings do not “protect” anyone from anything. Browser based implementations (such as blocking your browser from viewing certain ratings) would prevent people from seeing “offensive” material but that is a different matter. Film style age ratings are far from 100% successful in stopping people seeing offensive films (have you seen Mama Mia?) and they are only moderately sucessful in stopping people seeing age-inappropriate content. Why would they work on the internet? Despite being culture secretary, Mr Burnham appears unaware that the internet is global in nature. This website is written by British people, hosted on a German server and has 60% of its traffic from the USA. Who gets to say what is, or isnt, appropriate here? Harmful content is very culture-specific and by its nature, the internet skips over these boundaries. Do we censor information that the Iranians find offensive? Or the North Koreans? Or southern-US Baptists? Who gets to choose what is harmful? What gives that person the right to say to me what is harmful for my children? There are some common standards that could be applied, but I suspect there are less of these than Mr Burnham thinks there are. Some cultures think it is acceptable for people to watch criminals being executed, others don’t. Supporters of capital punishment talk about the death of the criminal serving as a deterrent to others. This only works if others know of the death, which is why most executions of this nature are public. Is it harmful (in this context) for people to see the punishment carried out? It is “harmful” in the eyes of a culture that does not condone the death penalty, but why should that culture control the internet? One thing that screamed out at me was the idea that a video clip of a beheading was unacceptable, rather than the beheading itself… But, in my charitable mood that might have just been a turn of phrase. [Mr Burnham] also plans to negotiate with the US on drawing up international rules for English language websites. Wow. So the UK and US will make a pact that dictates the rules for Australian websites? That sounds fair. What about Iranian websites translated into English? This is mind-numbing madness. Hopefully the US government is technologically literate enough to tell Mr Burnham to boil his head for a few hours. Equally, most video clips showing beheadings are on foreign language websites. What control does the US have over them (short of invading, although admittedly the US rarely stops short of that…). “Leaving your child for two hours completely unregulated on the internet is not something you can do,” he told the Telegraph. Another bit of madness. The internet is not a parent. It is not even a child minder. Parents need to be able to educate and assist their children, not rely on badly-thought out “ratings schemes.” Parents need to sit with their child as they surf the internet. Its like anything children do – if you abandon your child to do it, you have no control over what they do. You may think you have some say, but you dont. Take the ratings scheme: most children who are able to surf un-assisted will be able to change web-browers to one that ignores the ratings. Or better still, will be able to enter a URL without a .uk or .com ending where the UK/US RULE is ignored. Technologically backward parents will not be able to implement a control to prevent the child switching to [Lynx|Amaya|Chrome|Opera|FireFox|Mozilla|Safari|Etc]. Does Mr Burnham think every browser coder will be willing to implement a strong age-ratings control without new ones spawning up? Is he that foolish? He went on to say it was time to review the accessibility of certain content on the internet and insisted he was not trying to curb free speech. His plans are likely to anger those who advocate the freedom of the worldwide web. “You can still view content on the internet which I would say is unacceptable. You can view a beheading,” he said. For a culture secretary, Mr Burnham is woefully ignorant of what “freedom of speech” means. Personally I am opposed to beheading people. I find the death penalty for any crime offensive. Not everyone shares my opinion and, as a result, there are websites where you can read about executions. There are even websites that support the death penalty. I would say they were unacceptable. Does that mean they should be blocked from your browser? No, it means I shouldn’t view them. If I find something offensive, then I shouldn’t look at it. With my children, I sit with them to educate them about what they see. Should I accept your view of what is acceptable for them? The world is full of things which people will find offensive. I find children dying of hunger in Africa unacceptable. Does that mean we ban video clips of it (there go those Oxfam adverts) or does it mean we try to prevent it happening in the first place? Mr Burnham is right to be offended by the video clips of beheadings. So why dont we prevent the beheadings? I am sorry, Mr Burnham. As culture secretary you fail. I plan to trademark the question mark (? ), plus the charming upside Spanish question mark (¿) and the German ß letter. In fact, I might as well trademark any letter with an umlaut, (Ü) or a cedilla (ç) And I might as well claim the trademark ™ and copyright © symbols, while I’m at it. I may be forced to sue the world’s dictionaries and keyboard manufacturers, if they won’t just start paying on their own accord. Don’t worry, normal people. Of course, I’ll let you use my letters for your own humble non-commercial purposes. I’m only going to claim against the thieving bastards who use my letters for gain without paying me my well-earned compensation. For instance, 😉 is now one of his. I want to highlight that this is only directed at corporations, companies that are trying to make a profit without the permission of the trademark holder,” Mr Teterin said in comments on the Russian TV channel, NTV. “Legal use will be possible after buying an annual licence from us,” he was quoted by the newspaper Kommersant as saying. “It won’t cost that much – tens of thousands of dollars,” added the businessman, who is president of Superfone, a company that sells advertising on mobile phones. But he said he does not plan on tracking down individual users of the emoticon. On reflection, trademarking expressive-punctuation is the standard 21st century business model in a reductio ad absurdum guise. It doesn’t involve any messy production. (I guess that makes it count as eco-friendly and carbon-neutral.) It doesn’t incur any costs for materials or machinery. It doesn’t really employ any people so it cuts labour costs to the bone. (I don’t think lawyers count as people.) It certainly wouldn’t involve rewarding the creative thinkers who originally started using punctuation marks to express moods in text shorthand. It couldn’t generate any income except through trickery. It’s an entirely imaginary product, made out of screen pixels and worthless in itself. Doesn’t this sound like most of what passes for the “commanding heights of the economy” now? It’s as if “modes of production” and “relations of production” have been rendered meaningless and irrelevant, as if whole economies can detach themselves from reality for ever. As if economic bubbles can never burst…..
Quick question: Is the atheist blogroll broken on everyone else’s site? It has been about a week or so since I have seen it update here and show what blogs have new content. Is this a general problem? Of the sites I have checked today, all show the blogroll as static but with a different sequence of newly updated blogs so I cant for the life of me work out where the break is.